Smart. That’s Colt really paying attention to the CQB needs of the average concealed and open carrier. I think stuff like this is beautiful… the fact that it shows it’s age just makes it more attractive to me. Oddly enough, though, it would be illegal to carry in Texas and could result in loosing the right to carry concealed among other things. Stupid laws make it legal for me to carry a concealed handgun, but carrying a club, “knuckles”, or a knife with both edges sharpened or longer than 5.5″ blade length is not permitted. There’s a whole list of illegal weapons that I can’t carry – more’s the pity. Did you “Shopp” that yourself? No way I’m punch-shooting without a beavertail. Somewhere, I’ve seen a pic of a Webley-type revolver with the same basic arrangement. Wish I could remember where. Not a very good photoshop job! But it get’s the point across just fine. And I’m not sure if that’d be considered “Brass Knuckles” or not in Minnesota. It’d be interesting to see an Arms manufacturer actually make something like that though. That’s not photoshop sunny.. that’s a gov issue model M1911A1..
That is simply awesome. I WANT ONE!!!!!!!!!! I don’t think the 1970s ANAD (Anniston Army Depot) 1911s were ever offered for sale to the public. I believe this is a stolen firearm. Not stolen, its a photoshop job. 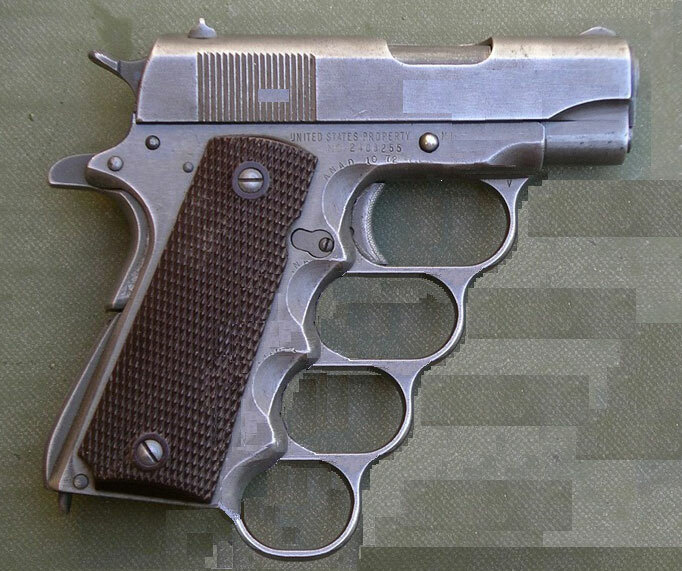 Think it was photoshop job from a calguns.net member, I remember the thread and saying it would be freakin awesome if possible, but knuckles of any sort are illegal in California. I know it is a photoshopped image, but it came from a real photo of a real 1911. Anniston rebuilt 1911s for the military in the 1970s long after you could purchase them from the DCM. your right. it must be stolen there are no other possible explanations for a guy being able to take a picture of a military weapon. Cameras werent invented then. This way you can aim down the sights when you throw a punch. Wouldn’t wanna miss. That’s pretty cool. I forgot how many guns were in that movie, I might have to watch it again someday. That’s not a knuckle duster 1911… I don’t even think it’s a 1911… there are no loops, what you’re seeing is just the front end of the bottom of the grip/magazine… Look closer at it, and you’ll see that if it were a knuckle duster, the garter would be going THROUGH the loops, because of how close it is. It’s just a standard pistol. That’s one way to reduce muzzle flip! Lol clearly photoshopped. Look at the background. Yes, the link pretty much confirms it was taken/stolen and recovered in Iraq. Is it just me or anyone else notice this thing is marked U.S. Property ?? Needs to have a “skull-crusher”spike on the base of the grip. “US Property” indicates a surplus (C&R)firearm.